Memorial card for General Gallieni who was called from retirement to defend Paris against the advancing Germans. His proclamation of September 3, 1914 asserts he will defend Paris to the end. "J'ai reçu le Mandat de dèfendre Paris contre l'envahisseur. Ce Mandat, je le remplirai jusqu'au bout." "I received the mandate to defend Paris against the invader. This mandate, I will fill to the end." 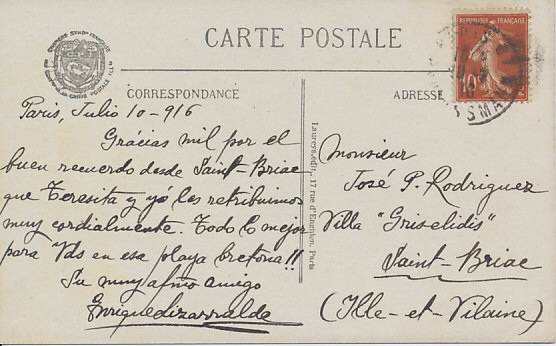 In Spanish, sent from Paris, July 10, 1916. After their defeat in the Battle of the Frontiers, the Allies retreated south from Belgium along the front from Verdun to the left end of their line. 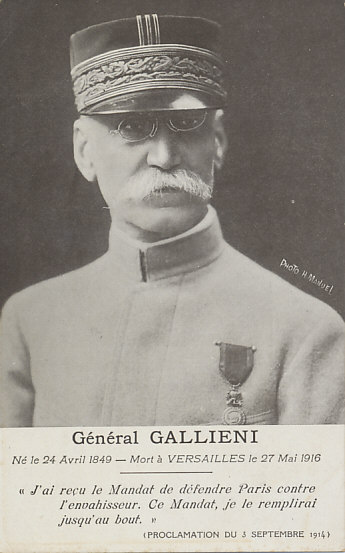 Fearful of losing Paris, the French government decamped to Bordeaux on September 2, 1914, putting General Joseph Gallieni in command of the garrison defending the fortified capital. As the Allies retreated, French commander Joseph Joffre reconfigured his forces, creating a new Sixth Army on the left flank of his line north of Paris. This army too retreated, even as it strengthened. At the far right of the German line, confident he had no concern on his right wing, German General von Kluck had changed direction from southwest to southeast to envelop what he thought was the French left. This move put him on course to bypass Paris to the north. 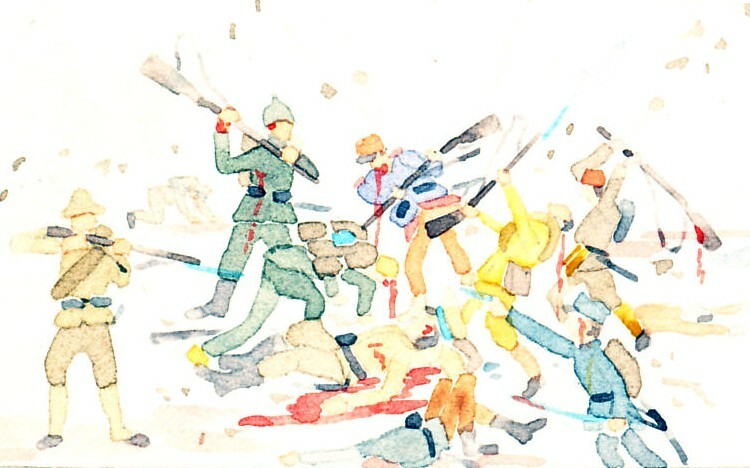 As they retreated, Joffre asked his generals when they would be ready to counter-attack. Newly commanding the French Fifth Army, Franchet d'Esperey would be ready on September 6. Having been called by the government, Gallieni had some independence from Joffre. He saw the turn of von Kluck's army, its exposed right wing, and the opportunity it presented. On September 5, even as other Allied forces retreated and prepared for the next day's offensive, the Sixth Army attacked from Paris, striking the right flank of the German First Army passing to the northeast. The Germany army turned to face this threat, widening a gap between it and the German Second Army on its left. In the Battle of the Marne, the French exploited this gap.